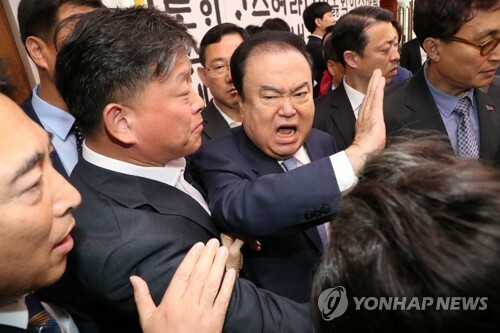 SEOUL, April 24 (Yonhap) -- The issue of South and North Korea's declaration of an end to the 1950-53 Korean War will be tied to progress of North Korea's denuclearization, a ranking government official said Tuesday. The establishment of a permanent peace on the Korean Peninsula is one of the key agenda items for a summit between President Moon Jae-in and North Korean leader Kim Jong-un on Friday. They will likely discuss ways to replace the current armistice with a peace treaty. A ranking official at Seoul's unification ministry said that ways to bring a permanent peace to the peninsula are likely to be pursued in a phased manner. "Without the progress of (the North's) denuclearization, it would not be realistic to discuss ways to establish peace," the official said, when asked whether it is possible to declare an end to the war, regardless of the North's nuke issue. He said that as these issues are linked to each other, the two Koreas need to coordinate in a way that convinces the international community. The official also added that North Korea's recent pledge to shut down a nuclear test site has shown that the country is serious about denuclearization, a ranking government official said Tuesday. The North announced Sunday that it would suspend its nuclear and long-range missile tests and dismantle its atomic test site in the northern province, but experts remained cautious about the North's willingness for denuclearization. "Experts' evaluation might be different, but I think that North Korea seems to try to show it has a willingness to engage in negotiations for the goal of denuclearization," he noted. The official said that Seoul is open to holding high-level talks and sending special envoys to the North ahead of the summit to fine-tune details about the upcoming meeting. "The two Koreas are currently in consultation over details of the agenda, but their leaders are likely to adjust and discuss major parts of them at the face-to-face meeting," he added.